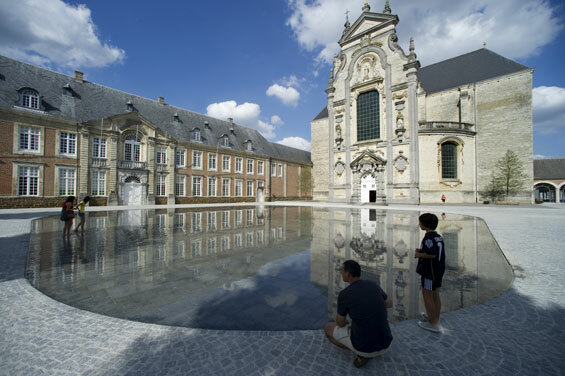 In the summer of 2012 the recently rejuvenated courtyard of Averbode Abbey has opened its doors inviting everyone to enjoy its centuries-old architecture and Baroque church standing at its heart. 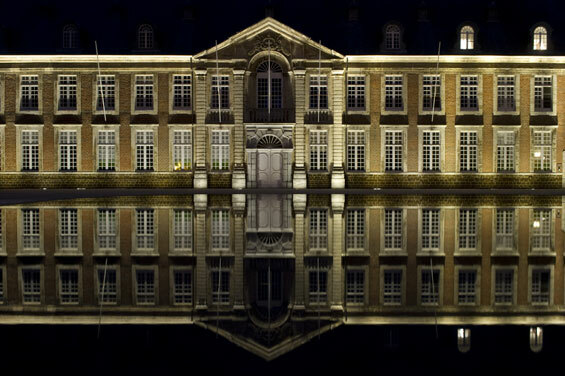 These impressive buildings are literally reflected in the grand water mirror calmly sitting at the centre of the square. 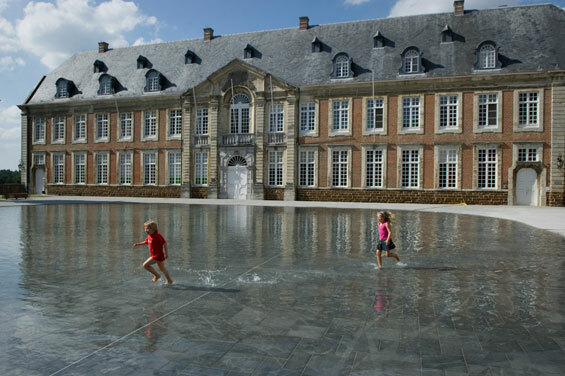 The large film of water, which is only a few centimetres deep, not only provides an alternative view of the surrounding buildings, but also welcomes the visitor to rest beside it on a nearby bench and enjoy its tranquil character or even walk in it during those rare hot Belgian days. Averbode Abbey’s historical role is thus recreated in its own courtyard by bringing together people of all ages from around the region. 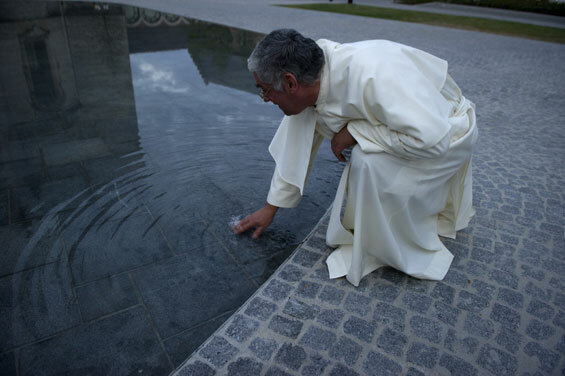 Since the history of Averbode Abbey began in 1134, it has undergone many changes. When the abbey’s courtyard first took shape it was in the form of three narrow cobblestone pathways upon a stretch of land covered with grass. It is only around the beginning of the 19th century that the square began to take on the configuration which is still present there today along with the surrounding buildings of the abbots’ quarters, the presbytery, and the gatehouse. In its recent history, precisely in 1976, the abbey’s square was transformed from a largely green courtyard into a space paved in stone. This drastic change in setting allowed the abbey’s visitors to shift the function of the courtyard from a serene resting place into what is essentially a parking lot. 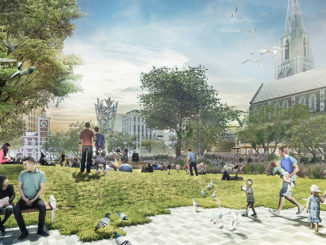 However, after a few more decades past and with the condition of the square getting worse, a renewed desire for a peaceful public space began to emerge. 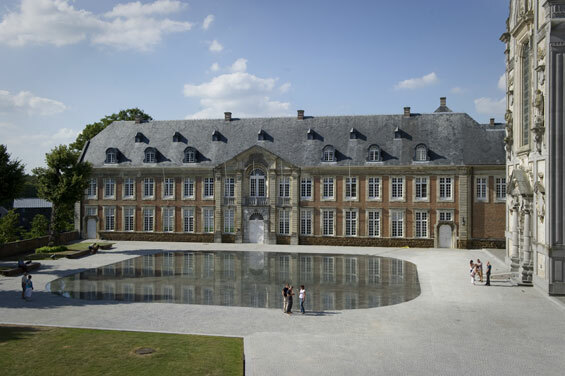 In 2010 the decision was taken to reconstruct the abbey’s courtyard and forecourt, amounting in approximately 5,000m² of redesigned space. 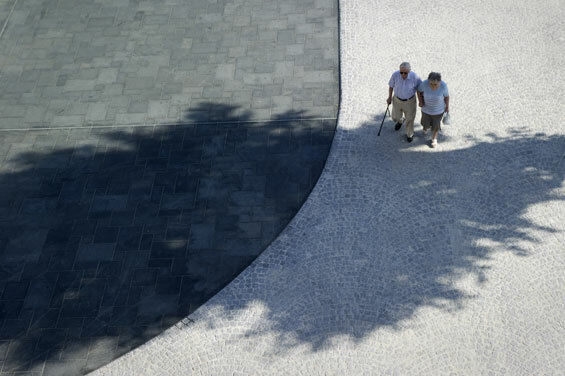 The new square’s design strives towards simplicity and homogeneity with its context. Rather than competing with the surrounding historical buildings, it only works to enhance their strong presence. 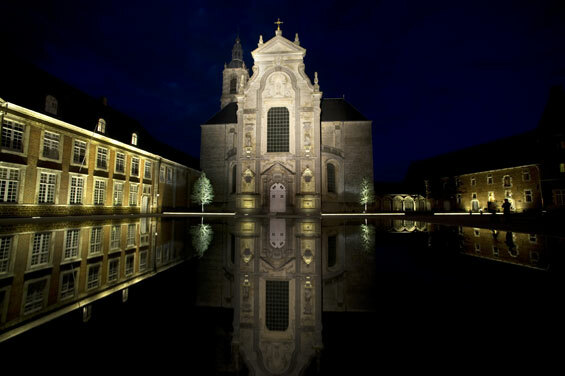 Walking through the gatehouse of Averbode Abbey now, after the realisation of the square’s new design, one is confronted with a picturesque view of the abbots’ quarters and its shimmering reflection in the water. On the rainy days the water mirror is filled up with rainwater flowing down from the square which is collected in a slightly depressed surface creating this large puddle. The flexibility of the courtyard is guaranteed with the possibility to drain the water from its resting place, thus increasing the usable area of the courtyard for various events. 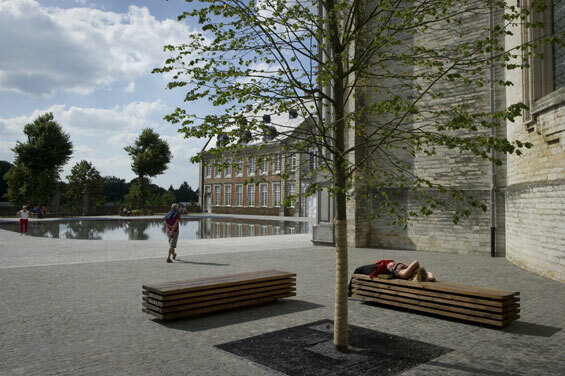 Along with the water mirror, the quality of this public space is improved by the integration of its ancient Tilia trees with old periphery wall and cobblestone path, as well as the integration of new parking spaces for visitors with reduced mobility, and sufficient facilities for those who choose to visit the abbey by bicycle. 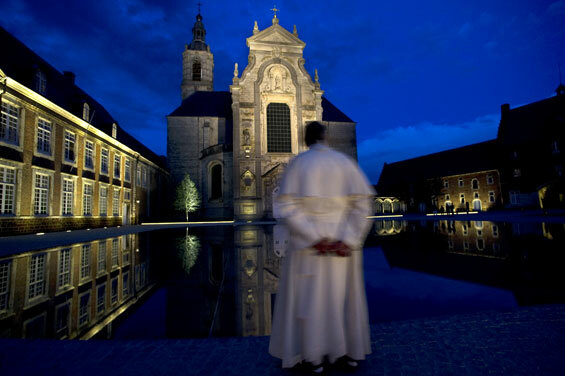 During the dark hours of the night, the square itself is dimmed by the light reflecting off of the church and other surrounding buildings and LED strips are used to accentuate the direction of the pathway. Taking into consideration the rich history of Averbode Abbey, it was imperative not to bombard its visitors with historical information, but instead to subtly introduce its history in the square itself. Hence, out of respect for the context all of the information panels, bins, and bicycle racks have been custom designed and manufactured in dark rusted steel reminiscent of the ferrous iron sandstone appearing in the façades of the abbey buildings.